When it comes to ice fishing and for the most part fishing in general, anglers should always take advantage of opportunities to watch and learn from other anglers. After all, what better source of information is there than personal tips from the local, die-hard fisherman who’s fished his body of water all his life? I’m not too proud to admit I’m relatively new to the ice fishing gig; and frankly I’ve been trying to get out on local waterways with all kinds of folks to learn some ins and outs of the game. This particular day I happened to be out with a plethora of ice fishermen with a variety of skill levels. Some were experienced veterans; some were weekend warriors; and some were, well, let’s just say they don’t fish a lot but they can sure drink beer with the best of us. They made for most of the laughs throughout the day! But when it came down to it, we all learned quite a bit. Fluorocarbon leaders connected to the tip-up line make the bait seem to struggle and look vulnerable. Usually something in the range of 30-lb. is a good starter. I choose fluorocarbon over monofilament because it doesn’t stretch on hook sets. Then, an ultra-thin steel leader should be attached to the fluorocarbon. 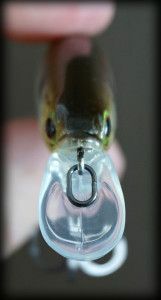 The extra strength of the wire leader improves your hook-up ratio in situations when you run into toothy fish like northern pike. At the same time, the thin nature of the wire leader also creates the illusion that your bait is not at all connected to line and it looks more enticing. Finally, try a variety of presentations. On this day, for me, the difference was using red treble hooks. For whatever reason, the bigger fish were biting on the baits with red hooks. Some days, small changes like these may help the bigger fish bite. 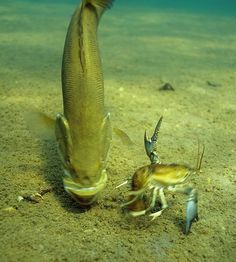 Don’t be afraid to try an unconventional bait, color, or presentation. You may just discover a pattern that really works! This leads right into my second piece of advice. When you find a pattern that works, stick to it. There’s an old saying, “don’t leave fish to find fish”. This means if you’re on quality fish, there’s no reason to move on to look for something elsewhere. That day, I continued to think that someone was going to find a trophy fish on the end of their line. After seeing three others in our group pull in keeper pike, including a 29” fish, I was starting to think it just wasn’t my day to get a keeper. 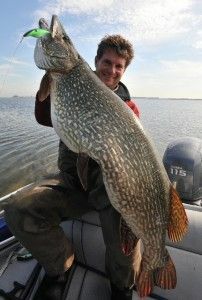 Granted, I had caught two other short pike that day, including one on an ultra-light jig rod with 2-lb test, what a fight! Though once we started getting all our tip-ups in the right depth, area and rigged correctly, we were catching fish consistently! Always remember to keep a record of your best spots for future reference as well. Take advantage of mobile app technology and online fishing maps from websites like Fishidy which help make marking your best catches and spots a breeze from your mobile phone. 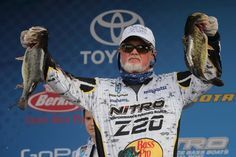 Quality fishing equipment makes a huge difference. 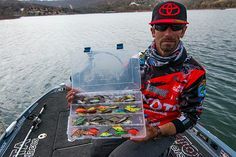 Whether it’s hooks, line, leaders, tip-ups or even bait, make sure you’re using the right gear for the fishing conditions. Sharp, strong hooks can make the difference between getting a fish in or not. 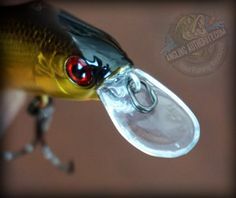 Be sure to check trebles just as if you were throwing a crankbait out on the boat. Also, be sure to use a hook with a strong steel shank to prevent the hook from flexing or breaking. It’s important to get deep hook penetration on the first pull when hand lining. Check your line after each bite or catch. Any frays or nicks should be corrected right away. You should do the same with your leaders. Don’t skimp on line strength too much, but don’t overdo it either since you don’t want fish to be able to see the leader. Finding the right balance of equipment for the species you’re targeting is key. Utilize high quality electronics such as flashers and depth finders to help locate suspended fish. You don’t need to break the bank, but the right electronics can mean the difference between getting skunked and enjoying an afternoon shore lunch. As the day progressed there were hot streaks of multiple flags within an hour, and times where we sat and drank beer for, seemingly, hours before we scampered to the next tip-up that was spinning like a top. All in all the fishing was hot, the beer was cold, the company was great and memories were made! Whether it’s the frosty, Midwest ice fishing scene or the open waters of the South, get out there. You can’t put a trophy on the wall while sitting on the couch! Jon Giacalone is an avid angler and the Digital Marketing Manager of Fishidy, a digital fishing guide with thousands of online waterway pages across the U.S. containing maps with proven Fishing Hot Spots®, local fishing reports, and advanced tools to help you catch more fish.